Editor’s Note: Francis Hamit, who self-published two Civil War espionage novels, The Shenandoah Spy and The Queen of Washington, contributes insight pieces about the strategies and emerging technologies he uses to market his books. By Francis Hamit: This story caught our eye yesterday and comes on the anniversary of Belle Boyd’s death while on a lecture tour for the Grand Army of the Republic, a Civil War veterans group. The Belle Boyd House in Martinsburg is run by the Berkeley County Historical Society, and the organization is in need of funds to finish the restoration of the historic home. Built in 1853, the Belle Boyd House was home to the famous confederate spy Belle Boyd during the Civil War. Now, it’s home to the visitor’s center and houses exhibits of Civil War history. According to the Berkeley County Historical Society, the house is the only house still standing associated with Boyd. Curator for the Society, Carol Appenzellar, said they’re currently in the process of researching more history of the house and Boyd. “As we interpret her life more, hopefully bring in more items that belonged to her, then we’ll be able to enrich that whole story of her in this time period,” Appenzellar said. Appenzellar said the goal is to bring in more exhibits with historical data representing Belle Boyd during her reign at the House. The president of the society, Todd Funkhouser, said they saved the house from demolition in 1993, but since have been struggling to renovate what’s necessary in the home. This is more than just a house; it is also a museum and research center run by volunteers. The late Don Wood, founder of this organization, was very helpful to us during the research for The Shenandoah Spy. The cost of replacing all 35 windows is about $14,000. 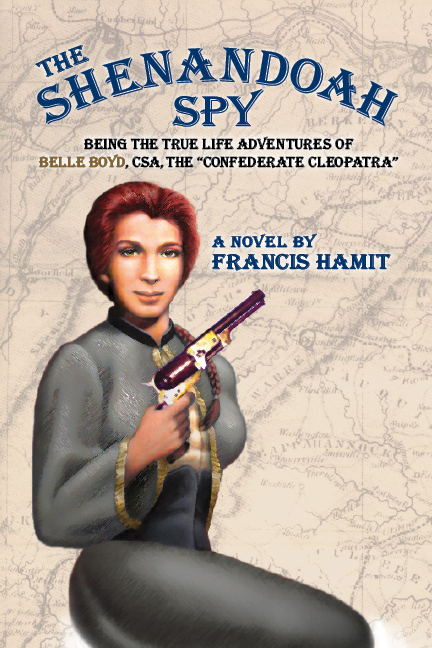 This is our chance to pay back while letting more people read about Belle’s first year as a spy and scout for the Confederate Army and her heroism at the Battle of Front Royal. We are going to set up a special sale of one thousand copies of this book and pledge $14.00 of every sale to Belle Boyd House for window replacement. This will be done though a special program with our distributor, Pathway Book Service. Details to be announced next month. It will be fairly simple. You order the book and pay for it at the regular price of $22.50 plus $5.25 for shipping by USPS Priority Mail and we will give $14.00 to them. The rest covers our expenses. Now if you’ve read the book and don’t want another, just send the entire amount (or more) to Belle Boyd House, P.O. Box 1624, Martinsburg, WV 25401. They are a 503(c) nonprofit and you can deduct it from your taxes. Not so when you buy the book, because you are buying a book. If, for some reason, you want to just buy the book and not donate or want the e-book or audiobook edition then check out our page on our page of Amazon.com. You can use their “Look inside the book” feature to read a sample of the text. Or if $27.75 is more than you can afford right now, you can buy the Kindle edition for $3.95. the famous confederate spy Belle Boyd during the Civil War. Wouldn’t a more measured way of commemorating a traitor be to torch the house and salt the earth it’s on? At the time of the novel Belle considered her country to be Virginia. She was passionate and a patriot. She married a Union Navy officer in London in 1864 and there was an amnesty in 1872. At the end of her life she was touring for the G.A.R. a group of Civil War veterans from both sides seeking reconciliation. She was widely admired and rock-star famous by the end of the war. Read the book and you’ll see why. @Francis Hamit: When the GAR was founded, it was for the veterans who had fought *for* the country. It was never open to Confederates. They had their own organization- The United Confederate Veterans. Both the GAR and the UCV where succeeded by the organizations for the children of the veterans.